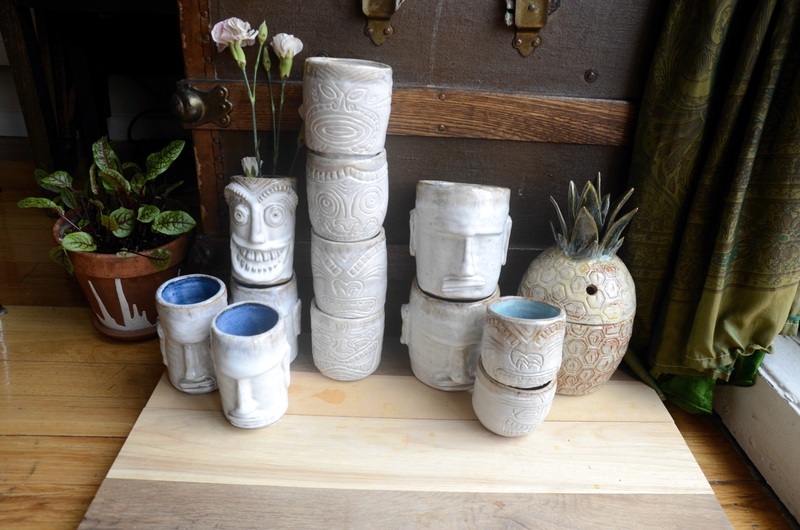 When I first started taking pottery last year at the studio around the corner on the Upper East Side, one of the first things I made was a little set of tiki mugs. My tiki love started when I found a photo of a tiki mug on Instagram and fell down a rabbit hole of gorgeous ceramic stoneware. As a complete novice when it came to pottery class, I made a lot of wonky little cylinders in the process of learning to throw on the wheel. Turns out, tiki mugs were the perfect solution to hide the imperfections from my mediocre pottery skills. Learning about all the different kinds of playful tiki mugs was the gateway for me to get into tiki drinks and culture. Before I dug into the history of tiki, I’d always thought the sweet, alien-colored tiki drinks were everything that is wrong with cocktail culture. They represented the world of pre-made mixers, overly-sugared syrups, and unnatural colors. To make a set of stoneware tiki mugs for yourself, it’s really not that difficult. The first thing you need to do is find a local ceramics studio that offers multi-week classes. I go to a private studio but there are also local rec centers and YMCAs that offer classes, too. After a couple sessions and a handful of YouTube tutorials, you’ll have all the skills you need to make tiki mugs! The first thing you need to do is weigh and wedge identical amounts of clay for your set of tiki mugs. I’ve found that 1.25 pounds of clay is a perfect amount for a good tiki mug. Next you need to throw simple cylinders on the wheel! I use my pin tool to measure the height and width of my mugs to make sure that the sets are all the same size. After you complete your cylinders and allow them to become leather-hard, it’s time to map out the face that you want to hand build on your mugs. I’ve taken simple cylinders and carved into them and I also make a simple tiki face. (Like the one below.) The parts pictured below are for a forehead, nose, lips, and ears. After you’ve got your face shapes constructed, it’s time to slip and score the back of the little pieces as well as your tiki cylinder. Adhere all of your pieces to the cylinder and smooth the edges. I use some slip and a paintbrush to make everything clean. After you’ve added all of your facial features, cover your mugs in plastic and let them sit for 12-24 hours. After that, you can uncover them and let them dry. Then it’s time to bisque fire your greenware! After the bisque, it’s glaze time. I like to make all of my mugs crazy on the inside, but white on the outside so that I can make lots of different patterns, shapes, and sizes while keeping everything somewhat uniform. I also dip my tiki rims in a glaze we call sin sin at the studio. It adds an iridescence to the top part of the mugs. I love the feeling of bringing home a new piece of pottery, and there is something extra delightful about adding another goofy set of faces to my already-ridiculous collection of cocktail accoutremant. …And then there were many experiments that I wanted to keep for myself to add to my collection of wacky faces. Also check out my article on how to make juice without a juicer!